We’re delighted to welcome some exciting new food faces this year, including the award winning Lebanese food and Antipodean coffee connoisseurs Wholefood Cafe, Thai street food specialists Bangwok and from the people behind The Breakfast Club comes The Little Green Trailer, offering hangover busting breakfasts to make you feel like a champion after a night lost in the Woods. There will also be lots of familiar faces too, with the enduringly popular Rac Shac bringing their signature giant wheels of Raclette cheese, the tantalising breakfast kedgeree from The Goan Seafood Company and deliciously addictive and healthy Happy Maki who make innovative vegan sushi rolls to order. One of End Of the Road’s corner stones Pizza Tabun are sadly not coming to the festival this year. 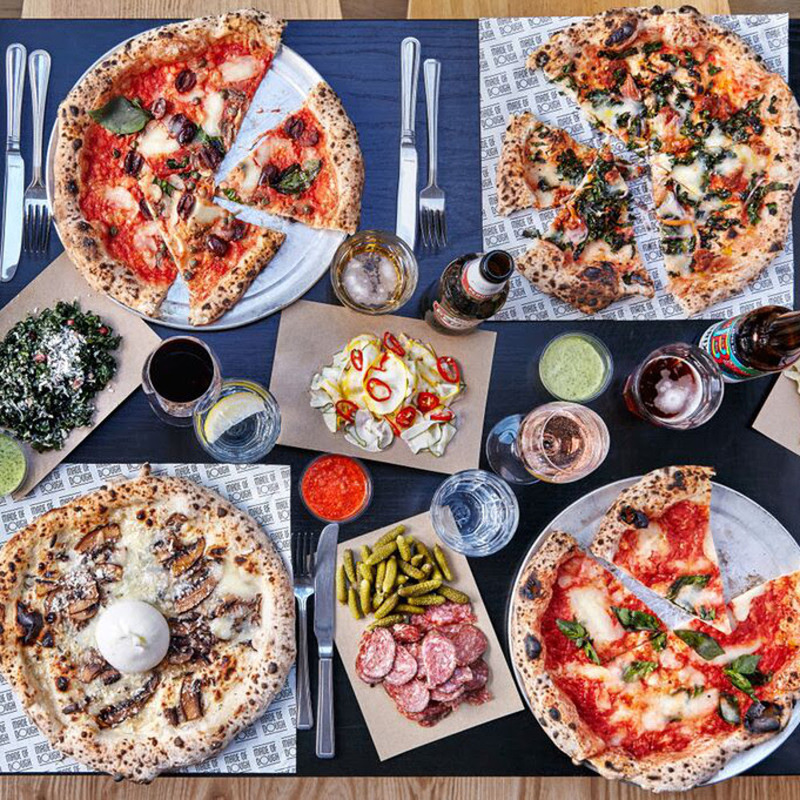 But fear not as we have invited another award winning pizzeria to join us, Made Of Dough, who serve the most delicious Neapolitan-style sourdough base concoctions we’ve ever tried. We’re also proud to host Beavertown Brewery for the third year running at End Of The Road this year, with all their sublime beer and ill behaviour. The Beaver Bar will return with the craft beers you know and love, with Gamma Ray, 8 Ball, Smog Rocket and festival favourite Lupuloid all making appearances, as well as Neck Oil available on draft at The Black Crow bar for the first time. And we’ve heard there will be some surprises in store as well… so keep your eyes peeled. If you can keep them open. In addition to the Beaver Bar, we’ve got lots of real ales returning the Bear Tavern as usual. We’re very lucky to have some of the country’s best real ale breweries located close to the festival and for the fourth year, we’ll be sourcing our real ale from local breweries. Real ales from Somerset, Wiltshire, Dorset, Hampshire and the New Forest covering a wide selection of styles, colours and flavours will be available to tickle your tastebuds throughout the weekend. The Black Crow and Peacock Bars will be serving the annual End Of The Road Ale, made differently each year by Milk Street Brewery, while The Badger Innis the place for early morning Bloody Marys, late night cocktails and a single malt and gin menu. Last but definitely not least, the infamous Cider Bus will be back with a bang, keeping the party going into the small hours. We are very excited to reveal the 2018 Day Splits and the addition of Tirzah to our line up. We’re also thrilled that BBC Radio 3’s Late Junction will be returning to the Tipi Stage on Friday night, curating another evening of experimental and eclectic music from around the globe. We are also partnering with Prince Charles Cinema for the first time, who will programme Saturday and Sunday at The Cinema this year. More details on both these special collaborations coming very soon. Headlining the festival on Thursday night are the indefinable and enduringly popular Yo La Tengo. Thursday’s opening act is still to be announced, while Loud & Quiet are set to host our first ever opening party with a late night Silent Disco, following the usual array of Thursday night surprise sets on The Tipi Stage. We’re spoiled for choice on The Woods Stage with St. Vincent topping the bill on Friday, with strong support from the venerable Josh T. Pearson and rising star Lucy Dacus. Saturday night plays host to Vampire Weekend’s only UK festival this year, preceded by festival favourite and delicately demented storyteller, Gruff Rhys. Feist will close The Woods Stage on Sunday night, following the always welcome return of End Of The Road sweetheart, Ezra Furman. Meanwhile, the iconic Garden Stage is an embarrassment of riches with Wilco frontman Jeff Tweedy on Friday and Velvet Underground John Cale on Sunday, assuming the mighty Oh Sees didn’t destroy it on Saturday! The astonishingly musically dexterous White Denim provide our happy ending on Sunday night, following avante-pop composer Julia Holter’s End Of The Road debut. We’re also thrilled to welcome Mulatu Astatke to the festival on Saturday, The Garden Stage providing the perfect setting for his unique Latin rhythm influenced Ethiopian Jazz. Friday’s Big Top line up is presented by Loud & Quiet with a staggering line up including the criminally talented Kaitlyn Aurelia Smith, Micachu collaborator and muse Tirzah, topped off by Detroit post-punk rockers Protomartyr. Uncut present Saturday’s bill, led by experimental electronic wizard James Holden And The Animal Spirits, with both Hookworms and Flat Worms closely behind. Sunday, hosted by our friends at The Line Of Best Fit, sees outlandish pop pioneer Ariel Pink bring the house down, with strong support from the wildly popular IDLES and Japanese Breakfast’s blissed-out guitar pop. For the sonically adventurous, as well as the return of BBC Radio 3’s Late Junction on Friday night, The Tipi Stage welcomes a wealth of exciting new talent. Raucous indie supergroup Warmduscher (fronted by Clams Baker of Paranoid London and backed by members of Fat White Family and Insecure Men who are also appearing at this year’s festival) will perform a late night set on Friday. Plus we welcome rising stars Snail Mail, described by Pitchfork as ‘the wisest teenage indie rockers we know’ and Nashville native Soccer Mommy, whose debut album proper Clean is one of the finest we’ve heard this year. In addition to all of this, throughout the four days, there will be the usual array of surprise performances, one-off collaborations and artist Q&As – presented in collaboration with The Line of Best Fit – that have become End of The Road’s trademark. There will be a variety of after-hours fun and dancing to be had at the Silent Disco, The Disco Ship and The Outlands, plus Loud & Quiet’s podcast series Midnight Chats recorded live on the Piano Stage. 2018 Family & Kids Activities Revealed! We have a wealth of activities for the whole family this year, taking place every day on our Wonderlands Lawn. For the musically curious, you can enrol in the School Of Noise who will introduce you to a range of noise making machines exploring the science of sound, that Jarvis Cocker says will “bring back a sense of wonder and accessibility to music-making”. If singing’s your thing, or even if it isn’t, start the day right with the Wake Up Singing workshop led triumphantly by A Trio Of Men. If you fancy exercising your creativity, there’s Sun Printing using light sesitive paper to create your own photographic prints, make your own jewellery with Copper Enamelling or try your hand at life drawing with Still Life For The Terrified. The kids will be kept entertained (and some adults, no doubt) with the ever popular HungaMunga’s Monster Mashup where you can make your own comic book or help make a giant comic strip. There will also be plenty of storytelling with Bird Stories and The Imagination Den with Tiny Wild Fox. 2018 Comedy & Literature Line Ups Revealed! This year’s Comedy Stage boasts a strong line-up with the usual blend of stand up, sketch, character, podcasts and political satire. First up, we are thrilled to welcome influential and satirical podcast The Bugle to End of The Road for the first time, where they’ll be recording live. The show created by Andy Zaltzman – also performing on the Comedy Stage this year and an EOTR favourite – and John Oliver, continues to broadcast with Andy and a host of international co-presenters. Joining him at the festival is comedian and frequent co-host, Alice Fraser, also performing a solo set this year, as well as a special guest to be announced. Next, we have Bafta Award winning Dave Johns. Instantly recognisable from his lead role in Ken Loach’s critically acclaimed I, Daniel Blake, Johns has been performing stand-up for three decades and has honed his talents as a poignant and warm performer, a skilled storyteller and a natural joke-teller. Our special late-night headline show comes from panel show regular and sometime Tim Key collaborator, Mark Watson. Cluster-bombed with yoghurt on TV’s Taskmaster, half-killed on The Island, Watson returns to the calmer surrounds of the Larmer Tree Gardens to perform his most recent full-length Edinburgh Fringe offering, The Infinite Show. Elsewhere on the bill you’ll find BBC Radio 4’s Newsjack presenter and Mock The Week regular Angela Barnes will bring her sharp-tongued comedy to the festival – tackling subjects like nuclear bunkers, aging and other people’s perceptions. Rising star Catherine Bohart’s engaging and distinctive stand-up has already earned her a place on the BBC’s New Talent Hotlist and fellow up-and-coming bright spark Bisha K. Ali, fresh from Radio 4’s Grownupland and The Guilty Feminist podcast, will showcase her laid charm taking on topics including race, politics, family and science. We are also delighted to reveal another fantastic literature line up, showcasing some of the most acclaimed, fascinating and moving writers around. As usual, during the morning of each day of the festival, a selection of authors will read from and discuss their work alongside more workshops than ever before, at The Library Stage in The Outlands. The hugely popular and influential Blacklisted Podcast, who will be recording an episode live at the festival. Hosted by John Mitchinson (QI) and Andy Miller, it has been garnering fans across the globe and they’ve promised a very special guest will be joining them too… Not to be missed. Best selling author and ex Guardian music critic Tom Cox may be more known for his hilarious but poignant twitter account My Cat Is Sad, following lamentations of his cat The Bear, but he will be discussing his latest book at End of The Road. In 21st-Century Yokel he explores the way we are tied inescapably to landscape, whether we like it or not. For the music writing lovers, Daniel Rachel’s critically acclaimed book Walls Come Tumbling Down: The Music and Politics of Rock Against Racism, 2 Tone and Red Wedge charts the pivotal period between 1976 and 1992 that saw politics and pop music come together for the first time in Britain’s musical history, while Tot Taylor takes us back further to question where songs actually come from and whether all songs are in fact just the ‘same song’. Revered new author Caroline O’Donoghue brings her critically acclaimed debut novel Promising Young Women, a striking, gothic and witty story about being a young woman in a man’s world. Last but not least, writer, broadcaster and columnist Christina Patterson will help us hold it together after a long night at the Disco Ship with her new book The Art of Not Falling Apart. A joyous, moving and sometimes shockingly honest celebration of life as an adventure, one where you ditch your expectations, raise a glass and prepare for a rocky ride. Cheers to that. We are very pleased to welcome back White Denim, who were last seen ripping up the Garden Stage in 2014. The Texan foursome have gained a reputation for being one of the best live bands around and, through their ten years, have explored everything from soul, jazz, and country to psychedelia, punk, and prog without compromising on astonishing musical dexterity. Danish band Iceage arrived in 2008 armed with the the most brutal punk rock we’d heard in a long time. They were just teenages then, and their sound has evolved over the years. Their upcoming album Beyondless is arguably their most accomplished, crafted, and moving record yet – the culmination of their three albums so far. We can’t wait to welcome them to Larmer Tree Gardens for the first time. Also added to this year’s bill are cult grunge foursome The Posies whose extensive back catalogue stretches across four decades, the lovable purveyors of indie pop Sunflower Bean and London-based experimental post-punk trio built around the remarkable and distinctive voice and songs of Serafina Steer, Bas Jan.
We are delighted to reveal the winners of this year’s Play End Of The Road Competition, who this year were chosen from a list of well over 2000 hopefuls. It was highest number – and highest quality – of applications the festivals has ever had. The three successful artists have won the chance to play at End Of The Road 2018, with one bagging a filmed session on site with The Line Of Best Fit. First up is Californian-born, Glasgow-based musician A. Wesley Chung, previously of Long Beach indie collective Boris Smile, makes blissful Americana befitting of his West Coast heritage. Lo-fi folk and fine artist StevieRay Latham charmed us with his melody-filled, poetic songs and last but not least London quartet Suggested Friends, who make effervescent and melancholic pop rock songs with catchy hooks and frenetic choruses. Joining headliners Vampire Weekend, St Vincent, Feist and Yo La Tengo on the bill will be the singular Josh T. Pearson, artistic polymath Wild Billy Childish & The CTMF, rising star Lucy Dacus and many more. We are thrilled to welcome back Josh T. Pearson, whose legendary band Lift To Experience has reached near-mythical status, their only album The Texas Jerusalem Crossroads inspiring a cult following while nailing the sombre mood of the time. After a decade of near silence, Pearson re-emerged with his acclaimed heart-wrenching debut solo record, Last of the Country Gentlemen. He played those songs at End Of The Road in 2011 to a mesmerised crowd, as Pearson seemed “truly to be wrestling for his soul” (The Independent). With a new solo album due this year for which he’s “got rid of the beard, cut my hair and started wearing colour”, Pearson is freeing himself from the mythology that has surrounded him since Lift To Experience’s implosion and we can’t wait to see it manifest on stage. Over four decades, the endlessly creative and subversive Billy Childish has produced a breadth of brilliant, uncompromising work in a long and hugely eclectic career that has seen him explore music, art, poetry and more. As a musician he’s released albums at an astonishing rate (approximately 150 albums and counting) taking in punk, rock & roll, blues, spoken word, nursery rhymes and garage rock. He’s fronted a number of bands down the years and in 2017 Wild Billy Childish & CTMF released their fifth album in five years. To mark the centenary of suffrage, Stealing Sheep are celebrating at End Of The Road with a brand new performance inspired by the suffragette movement. ‘Stealing Sheep’s Suffragette Tribute’ will bring together female musicians with design, AV and production students to create a marching band and procession featuring brand new music – all inspired by women, equality and empowerment. Lucy Dacus was a 19-year-old songwriter with a day job in a photo lab when her debut LP, 2016’s No Burden, sparked a 20-plus-label bidding war and two years of constant touring. With a new album out on Matador released last week to wild acclaim, it’s clear all that attention was more than justified and we’re as equally eager for her return to End Of The Road. Adding to the wealth of new talent on this year’s line is Nashville native Soccer Mommy, AKA Sophie Allison, whose debut album proper Clean is one of the finest we’ve heard this year. Infamous for their visceral and raucous live sets, supergroup Warmduscher (fronted by Clams Baker of Paranoid London and backed by members of Mutado Pintado, the Fat White Family, Paranoid London, Childhood and Insecure Men) join us for some wild rock ‘n’roll. With Flat Worms and Hookworms already in the bait bucket we’ve also bagged Cut Worms, the brainchild of singer-songwriter Max Clarke. The beautiful, transportative soft rock that makes up his debut EP was produced by Foxygen’s Jonathan Rado and we can’t wait for him to bring his springtime tunes to Larmer Tree for late summer. Our first headliners need no introduction. Vampire Weekend announce their hugely anticipated return with the first live show to be announced in four years, having last been spotted on these shores in the summer of 2014. End Of The Road will mark their only UK festival appearance this year and with rumours of a new album abound – their last being the universally acclaimed and Grammy Awards winning 2013 album Modern Vampires Of The City – we can’t wait to welcome the illusive New Yorkers to the Larmer Tree Gardens for the first time. We are honoured that multi Grammy Award winning Feist will be making her first ever appearance at End of The Road. The Canadian songwriter and one time Broken Social Scene member has long been on our wish list and her fifth album – and first in six years – Pleasure, emerged last year as her most defiant work so far. End Of The Road – her only UK festival this year -will be the perfect setting to bring this intimate set songs to life. Joining Vampire Weekend and Feist will be the inimitable St. Vincent, who returns for the third time to End Of The Road, having graced the Woods stage in 2014 and 2013, when she teamed up with David Byrne for their Love This Giant collaboration. Unique and daring, Annie Clark has had a spectacular year with the release of the seminal and prescient album Masseduction. Hitting The Guardian’s number album of 2017 and captivating audiences with her spellbinding, avant-garde live shows, St. Vincent has made the transition into singular rock star. We are delighted to have her back on her own terms. End Of The Road will once again open its doors on Thursday, with the indefinable Yo La Tengo kicking off things on the Woods Stage. Making their fourth appearance at End Of The Road but first time as headliners and about time too; given their consistently high standards over a dizzying 14 albums – with a new one due in 2018 – we can think of no better way to kick off the festival. And that’s just the headliners! We are very excited to welcome back Ezra Furman. A whirlwind of drama, joy and rock’n’roll brilliance, Ezra is a flag-bearer for the disenfranchised. With the anticipated new album Transangelic Exodus due in just a few weeks time and his Visions bandmates in tow, be prepared for a career defining set in September. Next up, two solo songwriters hailing from legendary bands; John Cale – the enigmatic Welshman and co-founder of the near mythical Velvet Underground – will bring his exciting and diverse back catalog, while Jeff Tweedy, front man and founder of the seminal US indie heroes Wilco (who headlined the festival back in 2009), will perform solo. We are delighted to welcome avant-pop composer Julia Holter this year, whose mesmerising music we’ve long admired. The brilliant 2015 album Have You In My Wilderness was lauded universally, and with a new album hopefully on the way this year, her EOTR set – and only UK festival – is bound to be very special. Another first timer and sonic adventurer, Kaitlyn Aurelia Smith, will be joining us in September. The much celebrated LA based producer and composer uses a rare modular system to create her kaleidoscopic electronic world. It really is an embarrassment of riches year, as we can reveal that firm festival favourite Gruff Rhys will return, bringing with him mesmerising stories and subtle compositions. We also have underground pioneer Ariel Pink making his End Of The Road debut and bringing his outlandish pop compositions from another dimension with him. As if that wasn’t enough, the father of Ethio-Jazz Mulatu Astatke will be blessing us with his presence for a triumphant, life-affirming live show. Thee mighty Oh Sees, last seen destroying the Garden Stage in the best possible way, return to shake the festival to its core with their primal garage punk rock once again and they’re bringing label mates DUDS and Flat Worms with them. Get ready for a Castle Face Records takeover. As usual we have a wealth of new talent making their way to the festival for the first time. Big Thief released two albums in just one year; their confidently named debut Masterpiece followed by the spine tingling Capacity. With both records all over the end of year lists, they are definitely one to watch. Acclaimed newcomer and Little Big League guitarist Japanese Breakfast will bring her blend of dark lyrics and blissed out pop melodies, while Julien Baker’s raw, intimate folk and reputation for assured, beautiful shows will surely bring the festival to a stand still. Plus we welcome rising stars Snail Mail, described by Pitchfork as ‘the wisest teenage indie rockers we know’ and BBC Sound of 2018 nominee Nilufur Yanya, who counts King Krule and The Invisible among her many fans. Last but certainly not least, we love a happy ending here at End Of The Road so it is with great pleasure that we invite revered Tuareg innovator form Niger Mdou Moctar back this year, after he was cruelly kept from us in 2017. Another singular artist who narrowly missed out on his debut back in 2016, is once part-time Syrian wedding singer Omar Souleyman. Thrilling audiences at festivals across the world with his thumping blend of traditional dabke songs and electronic beats, we can’t wait to see him and the vast array of artists already confirmed for End Of The Road 2018. Play End of the Road 2018 Applications Now Open! This year one of the selected artists will open one of the Major Stages (Woods, Garden, Big Top) and one will film a session with The Line of Best Fit. Other winners will receive a standard festival slot. If you are chosen as the act to open one of the Major Stages you will still be eligible for The Line of Best Fit feature, (and vice versa) – the two opportunities aren’t mutually exclusive but they won’t necessarily go to the same act. Only applications submitted through the online form will be accepted. We will not accept applications by email or social media. Only applications received by the closing date will be considered. You can see from our past line-ups what sort of music we are interested in. The winners will be notified by mid March, and announced on our website/Facebook shortly thereafter. Please do not email us to ask for updates. We will pay a fee of £150 for each of these slots, to help with travel costs etc. It is your responsibility to make your way to and from the festival, and you agree to be on time for your load in / stage time. You agree to provide the information required in our ‘Artist Brief’ in good time. Christmas Shindig on 6 December at Kamio, tickets on sale now! Headlining the night will be one of the highlights from this year’s exceptional festival, purveyors of languid and beautiful guitar pop Ultimate Painting. Joining them will be eight piece noise ensemble Nervous Conditions, one of the most exciting new UK bands. With a front man that sounds like a straight-edge Mark E. Smith over skronking sax, no-nonsense synths, violin and dual drums, resulting in something that sounds like Sun Ra on a post-punk binge. Very special guest DJs to be announced. Tickets are £12 each and available through Music Glue and DICE. Early Bird tickets for End of The Road 2018 sold out in a record 35 minutes this year. Tier 2 tickets are now on sale, along with our deposit scheme, here.